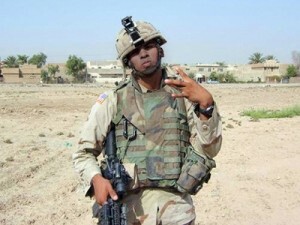 A soldier in a combat zone throwing gang signs. Federal officials are documenting a growing presence of gang members in the U.S. military, even while state financial support for local gang-busting and narcotics interdiction evaporates. The proliferation of organized criminal elements with military-trained members should raise red flags for law enforcement officials, according to a recent FBI report. “Members of nearly every major street gang, including the Bloods, Crips, Black Disciples, Gangster Disciples, Hells Angels, Latin Kings, The 18th Street Gang, Mara Salvatrucha (MS-13), Mexican Mafia, Nortenos, Surenos, Vice Lords, and various white supremacist groups, have been documented on military installations,” the report says. Even as the specter grows of Special Forces-trained gang-bangers roaming Main Street armed with killing skills and AK47s, cutbacks in state funding will help decimate anti-gang-related police activities in San Luis Obispo County. Last week, the state Department of Justice (DOJ) said it will terminate at the end of this year its involvement in most of California’s 52 drug and gang units because of funding issues. Paso Robles Police Chief Lisa Solomon, who in early September acknowledged that her city has a severe gang problem by forming a multi-agency program called “Safe Streets,” said Tuesday she is “reevaluating” the program’s future because of state fund reductions. The chief said she had not heard about gang members joining the military. “That is an interesting and disturbing phenomenon,” she said. This article raises an important issue, but lacks the stats. Willie raised a good question: what types of convictions will bar you from entering military service? A far more frightening statistic was recounted in some Times newspaper articles I read about contracted “private security” firms like Blackwater. The articles mentioned that there were as many private mercenaries in Afghanistan as there were regular enlisted soldiers. It is the private “civilian” soldier which has no statutory or military standard of training and conduct by which their actions may be judged and punished, when necessary. This article needs a follow-up! I am a true beliver in teaching the children not to lie. It is a regretable thing that if he was my son, I would take his truth and help him lie for a fair opportunity in life. I’m not sure that this is all bad. I tend to respect OUR soldiers reguardless of their race or personal beliefs. Having a well trained citizenry makes for better representation. No bearing on the article but that is not an American Soldier. Though he’s sporting a colored America Flag on his shoulder, nothing about his gear makes sense for an American Solier in Combat Zone. 6 dislikes? What, do you want it to be an American Soldier so bad? LMAO at some of the readers here. I believe that many would hope that someone being in a gang and military would realize how both cheap and predicious life is and to cherish all life, unless their brain is completely fried. Next, after his “honorable discharge” many would hope this grand second chance in life does not go to waste (abuse) or become a tax payer burden again (prison).